OK, I'm back to work now. After my previous post, where I got my first data ever with the new OpenBCI board (aka, "V3"), I took a little hiatus while Joel worked through some issues with the Bluetooth link. Everything appears to be working well now, so I'm back on the case. Yesterday, I connected everything up and recorded my first real EEG data with the V3. Exciting! EEG Setup: To get started, I set an easy goal for myself -- just record some eyes-closed alpha waves. So, I got out my trusty gold electrodes, my trusty Ten20 electrode paste, and put on a few electrodes. I attached one electrode to the back-left of my head ("O1"), the reference electrode to my left earlobe, and the bias electrode to my right earlob. So far, this is just like normal. Software Setup: For software, I used Arduino software for the OpenBCI Bluetooth dongle (aka, the RFduino "Host"), for the remote Bluetooth module on the OpenBCI V3 board itself (aka, the RFduino "Device"), and for the Atmel microcontroller that is the core of the OpenBCI V3 board (and which is programmed like an Arduino Uno). The software is surely going to change with time, but right now I'm working with this code here. On the PC side, I used a version of our Processing GUI that we modified to accept the new binary data format being generated by the V3 board. Data and Analysis: I did a couple of recordings of my eyes-closed alpha waves. My data and analysis files are here. Some example plots of the data that I recorded are shown below. This is my first time trying to analyze the data using Python instead of Matlab. Because I'm so new with Python, I was a lot slower in doing the analysis, but now that I've completed this one little task, I'm feeling pretty OK about the switch. Maybe, just maybe, it is possible to learn new tricks! around t = 88 seconds. By closing my eyes, I get alpha waves appear near 10 Hz. Time-Domain Plot: The top plot is a simple plot of the recorded EEG signal as a function of time. Actually, it's not a totally "simple" plot because I have done some processing of the data. I highpass filtered it to remove the DC component and I notch filtered it at 60 Hz and 120 Hz to get rid of power line interference. In my opinion, though, time-domain plots are not very useful when zoomed out to a wide range of time (like we're doing here). So, there's not much to say. 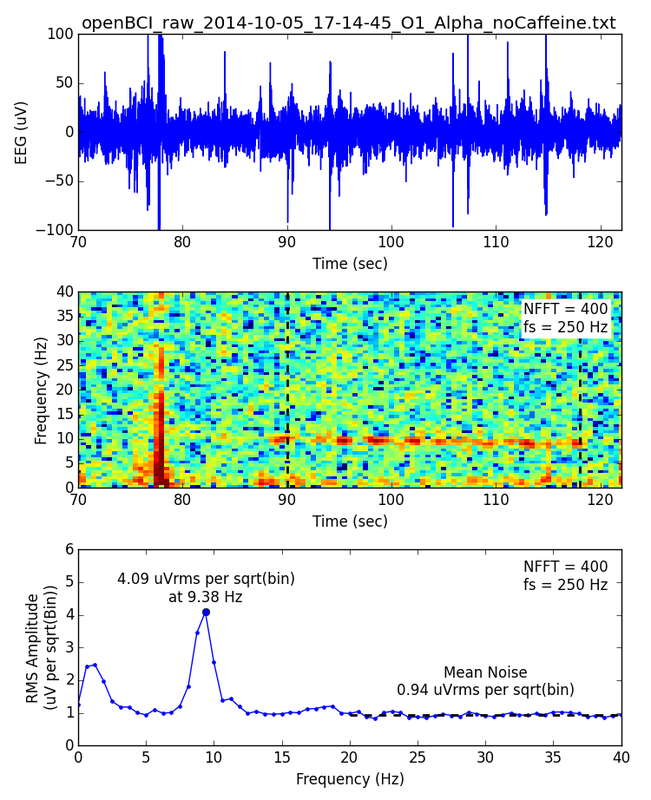 Spectrogram: The middle plot is a spectrogram of the same data. I love spectrograms. Here, time is again on the horizontal axis, but now frequency is on the vertical axis. The intensity of the color of each pixel shows how much signal energy is at the pixel's time and frequency. Here, by the red horizontal line that appears ~10 Hz, you can clearly see the alpha waves. Cool! Frequency-Domain Plot: Unfortunately, it is difficult to be quantitative about the amplitude of signals that are seen in the spectrogram. So, once I located my alpha waves (t = 90 sec to t = 118 seconds), I plotted the mean spectrum for the data just in that time period. The bottom plot shows this spectrum -- it shows the spectrum of my brain waves during t = 90 sec to t = 118 sec You can see the prominent bump around 10 Hz. These are my alpha waves. As can be seen. the amplitude is approximately 4.1 uVrms and the peak is focused at 9.38 Hz. That's my brain! Specifically, that's my visual cortex when it's bored because my eyes are closed! Wow. Two great pointers...both of which are totally BLOWING MY MIND! You never let me rest, Rob. Many thanks!